Is It Time To Bring Your Benefits Offering In Tune With The Modern Age? Most of us are very familiar with the traditional arrangement of employee benefits: 401K/Pension, Medical/Dental and Life Insurance. 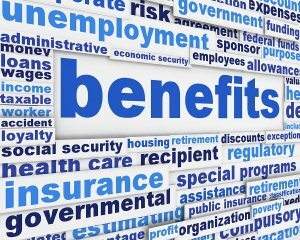 In the old days, these were the established mainstay of benefits, and employers simply had to offer these three things to satisfy employees and present themselves as an employer of choice in terms of their benefits offering. Dare, I say it, they were simpler times for HR professionals looking to design benefit programs that were appealing to the market place. But, of course, Google transformed all this when they exploded on to the scene with their fantastic and innovative lifestyle and well-being conscious benefits package. At first, we all thought, “they’re rich, successful and hungry, they are an aberration, no-one can reasonably expect this to become the norm.” However, that’s exactly what has happened. People have looked at this and thought, “we want a piece of that, we want lifestyle support and well-being to be central to our benefits.” I mean who wouldn’t want that? The same goes for 401K/Pension where I sense candidates are grateful for their employers helping to take care of their future retirement, but candidates also want to be in great physical shape to be able to enjoy their retirements package to the maximum. Workers desire to know if employers can help with that aspect. Therefore, if companies want to be an employer of choice in today’s post ‘Google Benefits’ world, they need to build a benefits strategy that both addresses the traditional bedrock of benefits (401 K, health), but which also addresses personal well-being and enhances or is at least in tune with the modern lifestyle pressures and requirements that we all face. Employers should not be scared of this—its win-win—as healthier, fitter and less stressed employees will be more focused, engaged, and will take less time off work through sickness and will ultimately be more productive. To help employers design a more modern benefits package, below I outlined several more new age benefits to place on top of the traditional portfolio of benefits to help you become a truly modern employer of choice. Flexi-time: Give employees a set of core hours (which might be 11am-3.00pm for example) and build a set of flexible hours around it which they can work at any time within the working month. Employees can use this flexi-time to attend appointments. Wellness benefits: Consider reimbursing employees a certain amount for purchases related to fitness, e.g. gym memberships, bicycles, yoga mats, and/or running shoes. Free chair massages: These were big once and there’s no reason why they can’t make a comeback to help relieve tension and reinvigorate staff for harder work. Optional telecommuting: There are plenty of studies which show that long commutes (over 45 minutes) are bad for your health. So, why not give the employees the chance to work from home one day a week, perhaps on a particularly bad traffic day? Corporate yoga: The links between Yoga, stress reduction and well-being are undeniable, so think about arranging on-site weekly Yoga sessions led by a trained Yoga instructor. Sabbatical: Offer sabbaticals after five or 10 years (perhaps a month of two in length) as a reward and to enable employees to take some ‘time out’, take a long holiday or give them some head space to do some clear thinking and ultimately improve their lives. Create a genuine culture of work-life balance: Establish an understanding in your business which says its fine to leave the office before 8pm. Manager’s must lead by example. On-site laundry service: Contract a provider to pick up and launder clothes and deliver them back to work clean. Cleaning service: Contract professional cleaners to tidy your staff’s homes once a month. Mindfulness: Engage mindfulness practitioners to deploy mindfulness techniques to help employees reduce stress and more effectively manage their mood, raising effectiveness and productivity.